Our doctors are highly trained with experience you can trust. Extracorporeal Shock Wave Therapy (ESWT) with the PiezoWave2 is a technologically advanced treatment for chronic pain for heel and ankle pain. Every member of our staff is happy to help with your podiatry needs. 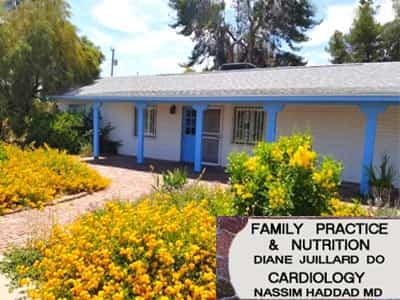 We have podiatry offices in Peoria AZ and Wickenburg AZ. Our foot and ankle podiatrists provide the highest quality of care for your feet and ankles to bring you the comfort and relief you deserve. 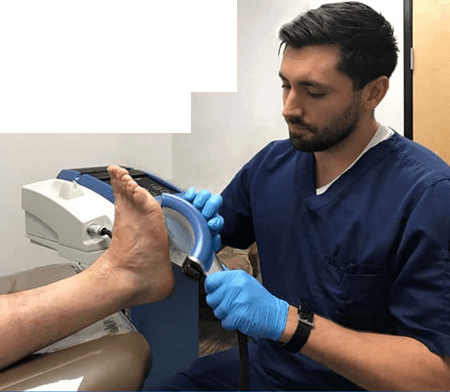 The podiatrist and staff at Peoria Foot & Ankle are dedicated to using the latest research and most advanced technology to deliver exceptional podiatric care serving patients in Peoria, AZ, Suncity AZ, Suncity West AZ, Surprise, AZ, Glendale, AZ, Wickenburg, AZ and other surrounding areas. Our specialists treats a variety of foot and ankle conditions, including ingrown toenails and heel pain, hammertoes, and performs Shockwave Therapy treatment for chronic heel and ankle pain. Are You Suffering from Chronic Foot Pain? * Short treatment sessions 10-20 mins. Some of our specialties include bunion treatment, stitch-less hammertoe procedure, non surgical treatment of heel pain, total ankle replacement, neuromas, plantar fasciitis, and ingrown toenails. Our podiatrists are experts in molded high tech, functional custom orthotics that can relieve pain and correct the mechanical function of your feet. The biggest single cause of heel pain in most adults is plantar fasciitis; inflammation of the connective tissue. In each foot, you have a fibrous band of connective tissue known as the plantar fascia, which starts at the heel and runs across the arch to the base of your toes. Ingrown toenails most commonly occur on the big toe and are caused by pressure that drives the edge of the nail into the surrounding skin. Ingrown toenails can result from improper nail trimming, injuries, or fungal infections and can be very painful. Orthotics are medical devices that go into ones shoes that are designed to give arch support and control the function of your feet. Foot pain is often due to poor foot support and stability and orthotics are often used in conjunction with firm shoes and stretching to provide relief. A bunion is a bump that appears inside the foot, near the big toe. Bunions form when the toe moves out of place. The bump is a bone protruding towards the inside of the big foot. If untreated, bunions can cause sever pain and even hinder walking abilities. Ankle pain may be caused from an unnatural twisting or force on the ankle or bones, or may be due to a ankle sprain. The ankle pain may cause redness, swelling, stiffness and warmth in the affected area. Other possible problems can include arthritis, or tendinitis. Hammertoe is one of the most common deformity of the second, third, or fourth toe. It is often caused by wearing narrow shoes with little to no arch support. The toe curls under and resemble the clawed back side of a hammer. No more Ugly Diabetic Shoes you HAVE TO wear. You will WANT TO wear these shoes that bring both comfort and style and allow you to maintain an active, healthy and productive lifestyle. 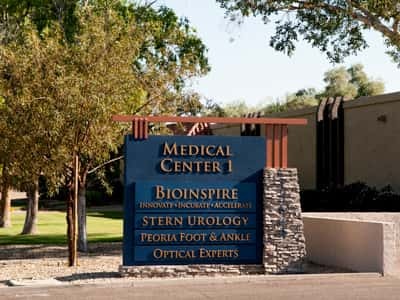 Our foot and ankle specialists are treating patients in both our Peoria, AZ podiatry office and Wickenburg, AZ podiatry office and are working together to realize a shared vision of uncompromising excellence in podiatry.